CitySprint is the largest same day distribution company in the United Kingdom. The company offers flexible same day courier and delivery services. It provides nationwide coverage with more than thirty service centres and over 2,500 couriers working throughout the UK. All couriers are equipped with CityTrakker, a GPS tracking unit that is used to provide real-time status updates for deliveries. CitySprint allows customers to track parcels with an online account when a delivery is booked account. A username and password is required to track parcels. Customers can also track parcels using their account number and job/air waybill number if the delivery was booked by phone. The tracking website also allows customers of CitySprint partners to track parcels, including home deliveries for Amazon, Asos, Ted Baker and other retailers. CityLink provides UK delivery services for businesses of varying sizes and logistics requirements. The company specialises in same day distribution and operates in all major mainland UK conurbations. CityLink’s nationwide network includes wholly-owned service centres and self-employed couriers based throughout England, Scotland and Wales. CitySprint works with a variety of organisations and businesses in a range of sectors, including health care and retail sectors. It is also active in supporting clients in the automotive and aerospace, environment and waste, facilities management, food and beverage, manufacturing, media, production and public relations, professional services, rail network infrastructure, utilities and petrochemical sectors. CityLink also works with public sector clients. The company often provides tailoring solutions that meet specific and unique requirements of clients. The company operates a network of 39 service centres, as of August 2014. According to CitySprint, more than 87 per cent of the United Kingdom can be reached by the company’s delivery network within 60 minutes. 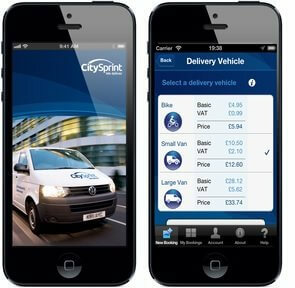 CitySprint operates more than 2,500 vehicles including motorbikes, small and large vans, and larger Luton vans. The company also operates pushbikes, and has the largest pushbike fleet in London. CitySprint operates 24 hours a day year-round, including on bank holidays. CitySprint offers SameDay Courier services for time-critical items, as well as fragile and items with an impending expiry date. SameDay Courier provides secure and timely deliveries 24 hours a day, seven days a week. The service is also available during bank holidays. Collections and deliveries are managed by service centres for local and national deliveries. Deliveries can be booked online, by phone or using the company’s mobile app, and can be booked ad hoc or scheduled in advance. Parcels can be arranged with a MyCitySprint corporate account or using a credit/debit card. 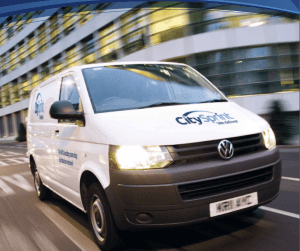 On all SameDay Courier deliveries, CitySprint provides indemnity up to £10,000 per consignment. The company provides £1,000 indemnity cover as standard per item sent with CitySprint’s SameDay service if it is undeclared or unspecified. If goods are declared, cover is free. A standard cover of £100 is offered for UK overnight services for unspecified items. Additional indemnity can be requested for a fee. All items are tracked in real-time and customers receive a time-stamped audit trail with details on the journey and final proof of delivery. Email and text message tracking notifications are also provided with details on the parcel’s progress and can be set up during the booking process. When arranging a delivery, CitySprint customers can also select the specific vehicle type they want depending on the size of the consignment. SecureData Courier is CitySprint’s service option for delivering confidential data or information within the United Kingdom. A courier is assigned to the parcel and provides secure delivery to the destination. Couriers are security-checked by the Disclosure & Barring Service (DBS). Items are delivered only to the addressee and a full electronic chain of custody is also provided, in addition to real-time tracking. CitySprint offers a range of Priority Courier options when same-day deliver is not quick enough. Priority services are the fastest way to deliver a parcel or document. The service includes real-time tracking and electronic proof of delivery the moment the item is received by the addressee. This service is ideal for urgent consignments and ad hoc bookings. They are typically arranged directly with local CitySprint service centres. CitySprint provides businesses with contract collections and deliveries to or from regular destinations. Options include hourly, daily, weekly or monthly set collections and deliveries. 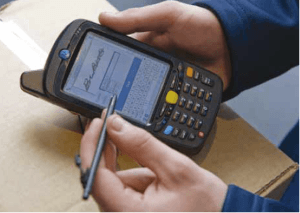 The service is delivered by CitySprint partners, including the Royal Mail and DX. The cost-effective service allows businesses to consolidate all inbound and outbound mail processes. A range of UK Overnight options are available for next day deliveries for parcels and documents. CitySprint works with service partners for mainland UK deliveries that are not time-critical or fragile. As a result, collections and deliveries are made by a third party and not by a CitySprint courier. CitySprint also has parcel and document delivery options to Europe and the rest of the world with international courier services. For international shipments, the company provides door-to-door express courier delivery with next day delivery to Europe and most destinations in North America. Deliveries to other parts of the world are within 36 hours or more, depending on the destination. CitySprint provides road service within Europe, a worldwide economy service, imports and overseas collections, and time deliveries worldwide. CitySprint operates service centres in major towns and cities throughout England, Scotland and Wales. CitySprint offers a search for local service centres on their website. MyCitySprint is an online portal for CitySprint account holders. It allows users to book collections and deliveries, as well as manage shipping preferences and payment details. Alternatively, non-account holders or individuals using CitySprint’s services for personal use can pay by credit or debit card by getting a quote and booking a courier. CitySprint offers access to MyCitySprint for registered corporate account holders. CityLink’s MyCourier app allows customers to obtain quotes and book a delivery. The app also provides users with real-time tracking, as well as permits them to view proof of delivery signatures, see the delivery’s audit trail and set a default collection point. Users may also amend or cancel bookings with the company’s mobile app. MyCourier also lets users link directly with their existing CitySprint account. Alternatively, users can use a credit or debit card if they are not account holders. The app is available for Apple, Blackberry and Android devices. CitySprint employs corporate staff in a range of fields, including business analysis, finance, I.T., human resources, operations, client services, sales and marketing, and fleet management. Employees benefit from 22 days holiday rising incrementally to 25 days, childcare vouchers, a pension fund and a Ride2Work cycle purchase scheme. The company also provides recognised training and career development opportunities to employees. 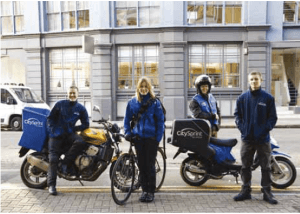 CitySprint also works with self-employed couriers who support CitySprint’s nationwide delivery network. Couriers work with the company’s service centres across the United Kingdom. For experienced drivers, CitySprint offers dedicated contracts. Couriers can also maximise earning potential with return load opportunities. Couriers have access to the company’s iFleet portal, a dedicated courier portal for electronic invoicing, job history information, VAT returns assistance, and offers to buy and sell equipment, vehicles and insurance at competitive rates. Further information about working with CitySprint are available on the CitySprints job opportunities website. CitySprint’s registered address is CitySprint (UK) Limited, Ground Floor, RedCentral, 60 High Street, Redhill, Surrey, RH1 1SH, United Kingdom. To email CitySprint, complete the company’s online enquiry.